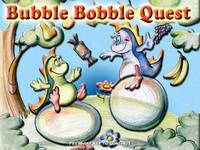 Bubble Bobble Quest is a brand new remake of the popular classic game Bubble Bobble. The main heroes are two little dragons named Bub and Bob. They live in a magical world that has been flooded with insidious monsters who are now after our two little friends. But no worries! In spite of their size the dragons are brave and clever. Plus they have a magical ability to blow bubbles, which can entangle their enemies inside of them. Once the enemy is trapped, the bubbles can be easily popped by the little fellows. The brand new Bubble Bobble story line along with the state-of-the-art innovative graphics, music and sound effects will simply blow your mind! Moreover, there are 10 new different types of dangerous monsters led by the Evil Troll, 100 levels, 150+ new items and bonuses, and a multiplayer mode in the new Bubble Bobble game! Download Bubble Bobble Quest and you will definitely fall in love with this exciting new Bubble Bobble game! We have no player reviews for Bubble Bobble Quest yet.